I am loving the Great British Food Revival on BBC Two at the moment. It is really firing me up about eating seasonal British produce and has saddened me to see so many of my favourite varieties of fruit and veg in need of resuscitation. Last week the burly duo the Hairy Bikers highlighted the plight of the British cauliflower. It seems that consumers are chosing greener vegetables over the nutritious, versatile and okay a little pale-faced cauliflower. 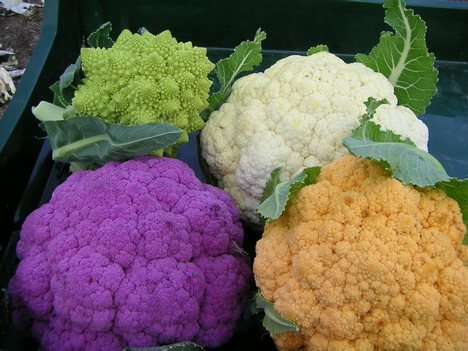 Screaming ‘look at me I’m cool’, shades of purple, green and orange have been introduced in a desperate attempt to improve the image of the cauliflower and lure it into your basket. Which ever colour tickles your fancy, chuck it in your curry, stir it into your noodles or crunch it in your salad – cook with cauli today! This soup is perfect comfort food. The grainy texture of the cauliflower makes it interesting and the spice from the coriander and chilli lifts it from the bowl. Serve with some crusty bread or naan and you have yourself a delicious winter warmer. In a large saucepan, melt the butter with the olive oil over a medium heat. Stir in the onion, garlic and coriander seeds and cook for 10-15 minutes until golden, stirring occasionally. Add the cauliflower and 300ml of the stock, bring to the boil and simmer for 20 to 30 minutes. Every now and again, mash the soup with a potato masher, rather than stirring it. When the cauliflower is soft and smooth, add the rest of the stock and bring to a simmer. 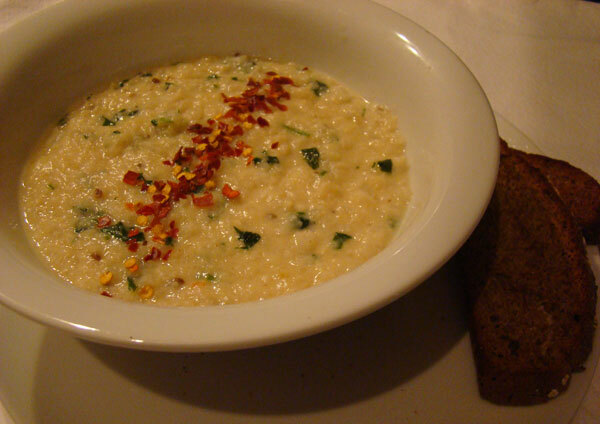 This soup has a slightly granular texture, which if you prefer can be avoided by using a liquidizer here. In a large bowl, stir the egg with the cornflour until a smooth paste is formed and stir in the yogurt (this will stabilize the yogurt when it is heated later). Whisk this mixture into the soup, bring to the boil, season with salt and pepper and stir in the fresh coriander. To serve, melt the 75g butter over the lowest heat. The pale whey will separate, turn golden brown and develop a nutty, caramelized aroma (but take care as it can burn easily). Pour a swirl onto each bowl and sprinkle with chilli flakes. Lovely! I was just this very moment daydreaming about cauliflower soups, as I have a much maligned white cauliflower languishing in my fridge. I do love spicy cauliflower, and I like the touch of brown butter at the end.